MARGINS Izu-Bonin-Mariana (IBM) Focus Site activity map showing instrument and profile line locations. Sources: ODP/DSDP sites – ODP data and (DSDP) . OBS locations, EW0203 and EW0202 shiptracks (multichannel seismic , swath bathymetry, gravity and magnetic data), and JAMSTEC active source refraction line - Calvert et al., 2008, and MGDS. Geochemistry and geochronology studies (Reagan et al.) - Reagan, pers. com., 2005. Guguan cross-chain HMR-1 sonar survey and dredge sampling – Stern et al. , 2006. On-land seismic stations - Wiens. Shear wave splitting experiment – Fouch, 2004. 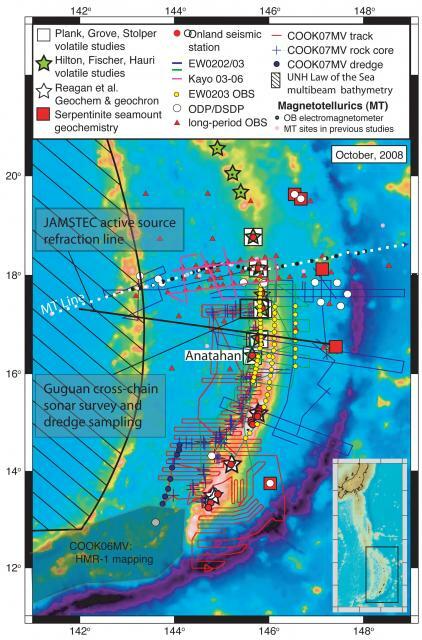 Anatahan - MARGINS event responses (May 2003 and March 2005). Magmatic volatile studies - Kelley et al., 2006 and Hilton, pers. com., 2005. Serpentinite seamount geochemistry (Ryan and Savoy) - Ryan, pers. com., 2005; NSF Awards (Mottl & McCollom 2007) 2005 Deep Magnetotellurics (MT) Experiment - Evans, pers. com., 2006. COOK06/07 data -- MGDS. Western Insular Margin multibeam 2006-2007 survey data from Gardner (UNH) included in GeoMapApp.